Imagine if our world changed. Imagine if dinosaurs roamed the land, and people, places and technology from the past, present and future were suddenly thrown together. This is the amazing setting of the Timeless series by Armand Baltazar. A world where Steam Timers, Mid Timers and future-dwelling Elders live alongside one another, trying to mesh together their beliefs and technologies as they keep out of the way of ancient beasts. This story world is like nothing I’ve ever read before. It’s rich and original, and it will leave you thinking about all the possibilities such a world would create. And that’s before you even get into the action-packed and addictive story. Diego and the Rangers of the Vastlantic is book one in this awesome new series. It follows Diego Ribera, a 13-year-old boy who has a talent for engineering (like his Mid Timer father) and who dreams of being a pilot (like his Steam Timer mother). Diego is trying to find himself and his place in the world, but when his father is kidnapped by a deadly enemy, he embarks on a dangerous quest to save him, accidentally dragging his best friend and some sort-of-friends along with him. They join a pirate crew, earn their place amongst their new allies and grow to be courageous warriors, determined to fight to save the people they love. This is a truly brilliant novel. With relatable and very real characters, heart-pounding action, an amazing story world and themes of courage and friendship, fans of science fiction, fantasy and adventure stories will devour it. But I don’t want to include a recommended age for this one. If you like epic adventures, if you like speculative fiction, if you like books that make you think and question, you will love this story. And I haven’t even mentioned the illustrations yet! Baltazar is a gifted artist. You will see it from the moment you flick through the book. His illustrations are striking, powerful and magical. They are so detailed and saturated with emotion, you would be forgiven for thinking they might be photos. In full colour, and with more than 150 of them scattered throughout the book, these stunning pictures pull you into the story world, providing rich visuals to spark your imagination as you read. They are works of art — the type of illustrations you want enlarged and framed on your walls. To have a whole book of them feels like the most precious gift. At 600 pages, this is a long book, but with a large font size, stunning illustrations to break up the text and loads of action, the book has been written and designed with younger readers in mind. But, again, this isn't a book just for kids. It's a story for everyone. 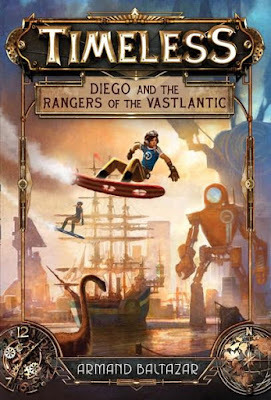 An incredible, powerful and addictive read, Diego and the Rangers of the Vastlantic is the start of something very special. The only thing left to say is where can I pre-order book 2?